At only 19, Alexander had to make a big life decision last August: As conditions soured in his hometown of Santa Ana de Coro, Venezuela, should he join his aunt and cousin on the migrant trail to Brazil? Alexander left his mother and sister behind and headed south from the Venezuelan state of Falcón for the Brazilian capital, Brasília. He works there now as a cashier. Alexander grew up under “Chavismo,” the political and social system created by the now-deceased Venezuelan leader Hugo Chávez. It mixed ingredients from Latin American socialist movements—like the Cuban and the Sandinista revolutions—with liberal doctrines of the 19th century. Mr. Chávez managed to rule for 14 years, leaving a historic but controversial legacy: While fighting social inequality and championing the poor as no other Venezuelan head of state had, Mr. Chávez did little to tackle corruption and violence. He also despised traditional democratic institutions, such as an independent judiciary and a free press, prompting both international observers and local political rivals to define his regime as dictatorial. On its 20th anniversary, Chavismo faces its worst crisis. Under the “chavista” heir Nicolás Maduro, who became president in 2013, economic and social conditions have only gotten worse in Venezuela. Venezuela withers under hyperinflation, and deep gloom now pervades in a country that is estimated to have the largest oil reserves in the world. The country’s political structures have collapsed, questions about the protection of human rights are raised every week, and Venezuela’s economy has fallen apart. Venezuela withers under hyperinflation, and deep gloom now pervades in a country that is estimated to have the largest oil reserves in the world. Elementary school teacher Maria Eugenia left the southern Venezuelan state of Bolivar in January 2016. After four of her five siblings decided to leave Venezuela for Ecuador, Mexico and Brazil, she decided to try her luck, too. “Because of inflation, my job was not enough to buy food,” she remembers. “Things were only getting worse and I felt my life was at risk: at least three times a week, thieves broke into my bus to rob passengers. I left my father and younger brother in Venezuela and joined my sister in Brazil.” Now that brother has fled himself, into Mexico. “I worked as a nanny, cleaning houses, as a manicurist, in construction; I gave homeschooling classes for Venezuelan children; I even sold colored Jello! Now I am a social educator at Caritas, helping to relocate vulnerable Venezuelan families in six states of Brazil,” said the 39-year-old teacher who lives in Boa Vista in Brazil’s Roraima State. Back home many Venezuelans still have nothing to eat, not only because they lack money to buy groceries but also because of severe food shortages, since many consumer goods are no longer being imported into Venezuela. That is part of the reason Mr. Maduro has become unpopular even among some of Mr. Chávez’s followers. On Jan. 23, while hundreds of thousands protested in the streets of Caracas, the opposition leader and president of the last free-standing democratic institution in the country, the National Assembly, Juan Guaidó, declared himself interim president. Mr. Maduro won the last presidential elections in Venezuela in May 2018, but the outcome was deemed fraudulent by both the opposition and international authorities. Now the list of countries that officially recognize Mr. Guaidó, 35, as interim president of Venezuela grows each week. Since the legitimacy of Mr. Maduro’s election is under question, Mr. Guaidó is seen as the only democratic leader who can officially call for new elections. Mr. Guaidó told the Associated Press that Mr. Maduro will not easily step down but must be forced out by economic sanctions, street protests and Venezuela's military. “We have to erode the pillars that support this dictatorship,” he said. Mr. Maduro has offered talks to the opposition but describes its challenge as a “vile” coup attempt. He still controls the country’s main oil company and the armed forces; any attempt to oust him could turn into a civil war. Some countries support Mr. Maduro: China, Russia, Turkey, Iran, Bolivia, Nicaragua, Cuba and Syria. “As long as there is a dictatorship in Venezuela, it is better not to return,” said Alexander. “Problems in Venezuela are so serious that even we Venezuelans have not really understood what is going on. I feel that there is an illegitimate government, a power that literally controls everything, but also an opposition that has defrauded the people many times,” he said regretfully. For Maria Eugenia, having Mr. Guaidó as interim president in Venezuela is a moment of hope. “We need international support for Guaidó. It is very important because Venezuela has been closed to the world. Maduro will try to prevent this opening, but I believe the other countries, even the United States, are doing their part to send humanitarian help and support migrants abroad,” she said. On Feb. 7 Mr. Maduro ordered the Venezuelan army to block the Colombia-Venezuela border bridge, preventing aid trucks from entering the country. 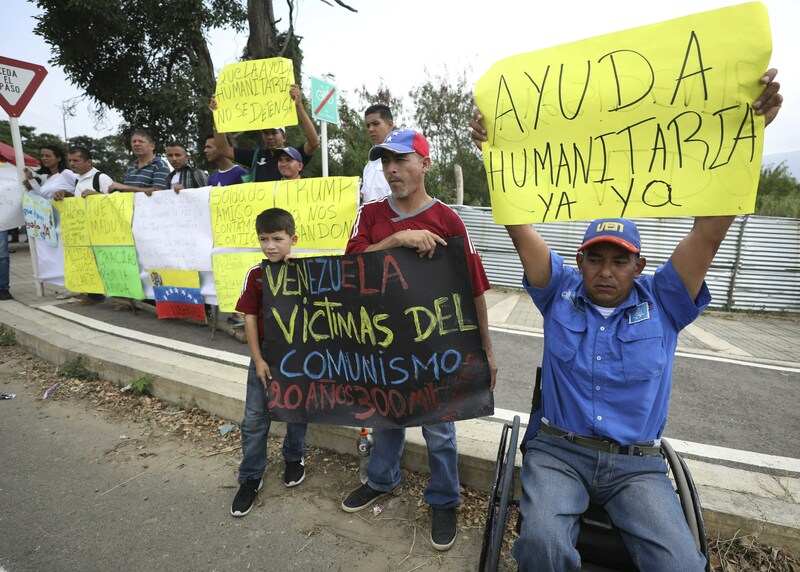 According to the United Nations, the number of Venezuelans fleeing the economic and humanitarian crisis is expected to reach 5.3 million by the end of 2019. This is the largest exodus in modern Latin American history. At least 3 million have already left. Colombia, Peru, Ecuador and Brazil are the main receivers of the Venezuelan refugees. Many who have fled to Brazil have experienced increasing levels of xenophobia. Alexander was in the Northern town of Paracaima, in the state of Roraima, when a group of Brazilians attacked a Venezuelan camp, accusing them of being thieves. His first job was at a hostel in Boa Vista. “I had to work for more than 12 hours a day with no day off,” he said. He would make the equivalent of four dollars per day—enough to buy about five bottles of milk. After getting his documents to remain legally in Brazil he quit and moved to Brasília. According to Elkyn, a 39-year-old administrator from Maracay, now in Boa Vista, it is hard to find a fellow Venezuelan in Brazil who supports Maduro. “It is a government that does not listen; they do not accept that what they are doing is wrong. Their policies do evil to the people and it seems to me that socialism is not well applied in Venezuela. The country is in crisis; the people are hungry,” he said. Several church institutions are involved advocating for the human rights of Venezuelans in Brazil and offering humanitarian aid. Alexander and many other Venezuelans have been assisted by Caritas Brasileira and resettled, both near the border—as they usually enter the country from the north—and in different Brazilian states that are now welcoming and integrating migrants. The executive director of Caritas in Brazil, Luiz Cláudio L. Silva, explains that the church charity has been working with migrants in the region for the last 40 years. But this sudden and large migratory flow from Venezuela through Brazil’s Northern region has demanded a reassessment of Caritas’s response. “We have been working, first, on emergency action at their arrival in Roraima,” Mr. Silva said. That means welcoming Venezuelans, finding them a place to stay and giving them a prepaid credit card that they can use to buy food. “Secondly, we gather partners in the U.S. and in Europe to help integrate migrants in big cities: Florianópolis, Curitiba, São Paulo, Brasília, Recife, Porto Velho and Manaus,” he told America. They offer Portuguese language and Brazilian law courses and help Venezuelan refugees find jobs. Because this game of presidential thrones is being played by many participants, both internally and internationally, Pope Francis is not taking sides in the Venezuelan crisis. After his trip to Panama, he told journalists that he was unwilling to interfere, but he was open to mediate dialogue as long as both sides of the conflict ask for help. He has called for a “peaceful solution”—that is, one that respects human rights. After dam disaster, can Brazil pursue economic development and care for its environment? Unlike Pope Francis, Venezuelan bishops have been bold critics of the Maduro government, calling it “illegitimate.” In a joint statement, the bishops’ conference, Venezuela’s Conference of Religious Men and Women, and the National Council of Lay People of Venezuela have demanded democratic elections. “The increasing repression for political reasons, the violation of human rights and the arbitrary and selective arrests are morally unacceptable,” these Venezuela’s Catholic institutions said after a wave of protests against the government that began on Jan. 23. “As citizens and servants of many communities, we demand that the state security agencies do not continue to repress their Venezuelan brothers and assume their true responsibility to protect the people in all circumstances, particularly when exercising the right to peaceful protest,” the report said. I believe the head of the Jesuits is from Venezuela. He was a big supporter of Chavez and a supporter of socialism. What was his relationship with the political hierarchy in Venezuela? Are the Jesuits chastened because of Venezuela? They should be. It explains the political orientation of America, the magazine. Are the editors chastened? I'm glad that our nation as well as many others in Latin America and Europe support Juan Guaido of the National Assembly. From what I've read, President Nicolas Maduro, whose election last year was widely deemed fradulant, is a dictator. Maduro's policies have caused horrendous social deprivation (widespread hunger, poverty, and lack of health care) and an economic crisis. I oppose military intervention by our nation, as I believe it would likely cause a deadly civil war. I agree with Guaido that economic sanctions, peaceful street protests, and the support of Venezuela's military for the opposition would be useful. Maduro, by not allowing humanitarian aid to arrive through Colombia, is demonstrating his immoral disregard for his own people. I can understand Pope Francis being reluctant to take sides in the conflict. However, I believe he would be a good mediator between Maduro and the opposition as led by Juan Guaudo. What about the game of thrones have you played it? Filipe Domingues is America’s São Paulo correspondent.